We have large trade deficits with Mexico and Canada. NAFTA, which is under renegotiation right now, has been a bad deal for U.S.A. Massive relocation of companies & jobs. Tariffs on Steel and Aluminum will only come off if new & fair NAFTA agreement is signed. Also, Canada must.....treat our farmers much better. Highly restrictive. Mexico must do much more on stopping drugs from pouring into the U.S. They have not done what needs to be done. Millions of people addicted and dying. If the E.U. wants to further increase their already massive tariffs and barriers on U.S. companies doing business there, we will simply apply a Tax on their Cars which freely pour into the U.S. They make it impossible for our cars (and more) to sell there. Big trade imbalance! When a country Taxes our products coming in at, say, 50%, and we Tax the same product coming into our country at ZERO, not fair or smart. We will soon be starting RECIPROCAL TAXES so that we will charge the same thing as they charge us. $800 Billion Trade Deficit-have no choice! 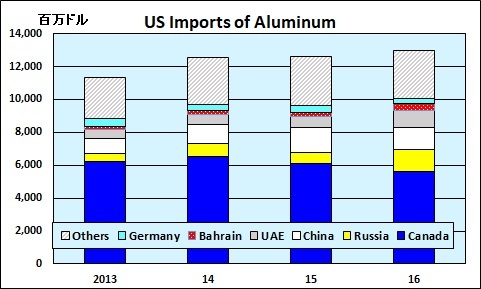 Our Steel and Aluminum industries (and many others) have been decimated by decades of unfair trade and bad policy with countries from around the world. We must not let our country, companies and workers be taken advantage of any longer. We want free, fair and SMART TRADE! When a country (USA) is losing many billions of dollars on trade with virtually every country it does business with, trade wars are good, and easy to win. Example, when we are down $100 billion with a certain country and they get cute, don't trade anymore-we win big. It's easy! We must protect our country and our workers. 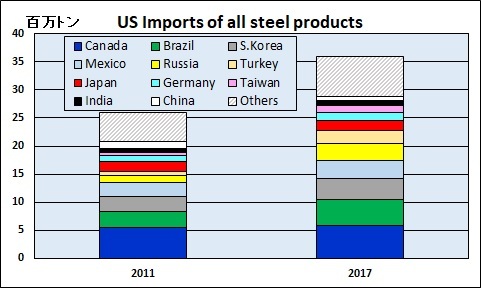 Our steel industry is in bad shape. IF YOU DON'T HAVE STEEL, YOU DON'T HAVE A COUNTRY! The United States has an $800 Billion Dollar Yearly Trade Deficit because of our "very stupid" trade deals and policies. Our jobs and wealth are being given to other countries that have taken advantage of us for years. They laugh at what fools our leaders have been.